Postdoctoral Fellow Anne Monahan consulted on the development of Horace Pippin: The Way I See It, an upcoming exhibition on self-taught artist Horace Pippin (1888-1946) that opens April 25 at the Brandywine River Museum in Chadds Ford, Pennsylvania. The first major exhibition of Pippin’s work in over 20 years, the exhibition brings together 65 of Pippin’s works from different stages of his career. 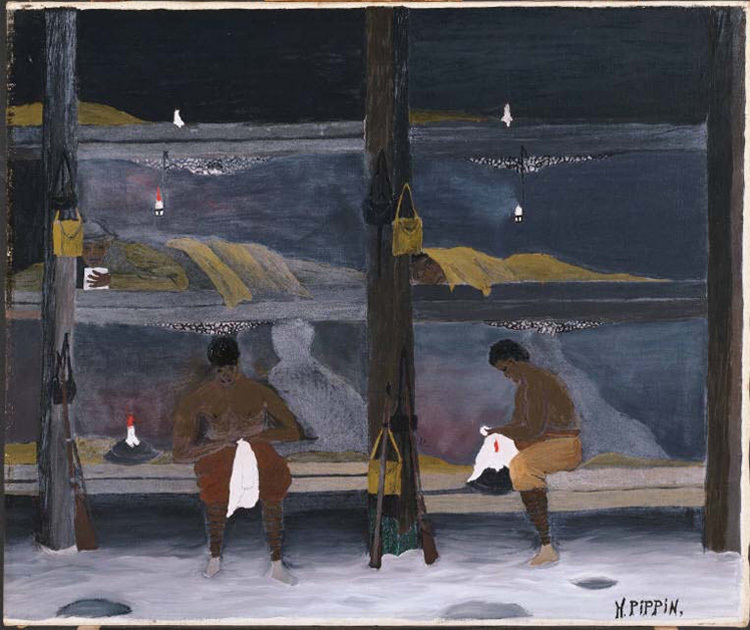 During her time at the Phillips, Dr. Monahan has researched Horace Pippin and unearthed new information about his family, his sources, and his relationship to the burgeoning market for his work in the 1940s. Her research focuses on his history paintings, his representations of African American labor and leisure, and new readings of a painting in the Phillips’s collection, The Barracks (1945). The Barracks will be on view at the Brandywine through July 19 as part of the exhibition. Elizabeth Steele, Head of Conservation at the Phillips, cleaned the painting before it traveled for the show, restoring the dark colors to full effect by removing a layer of white film that had leached out of the dark pigments over time.